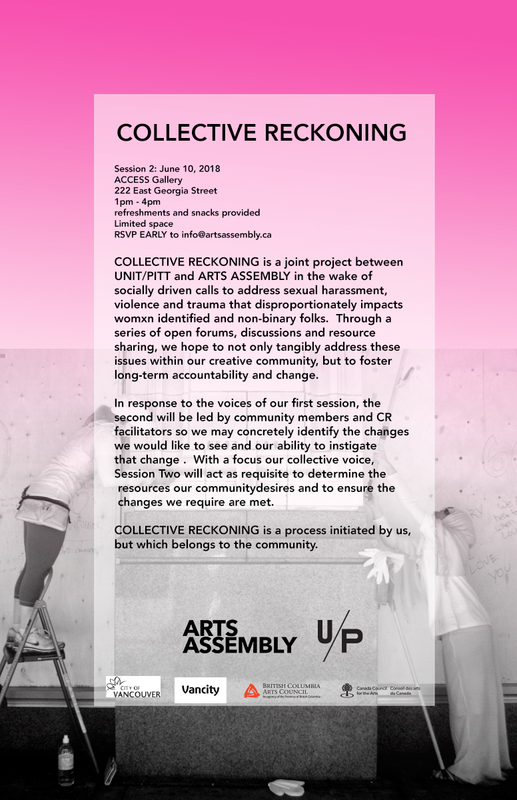 COLLECTIVE RECKONING is a joint project between UNIT/PITT and ARTS ASSEMBLY in the wake of the social media driven call to address sexual harassment, violence and trauma that disproportionality impacts womxn identified and non-binary folks. Through a series of open forums, discussions and resource sharing, we hope to not only tangibly address these issues within our creative community, but to foster long term accountability and change. We recognize the generous support of the Canada Council for the Arts, The City of Vancouver and the British Columbia Council for the Arts.